Free! Did I mention free? Beverly Ash Gilbert and Margie Deeb have teamed up, and this time added Jamie Cloud Eakin into the mix, to share a new e-publication on color choices. This 15-page issue is full of colorful discussions, diagrams and photos that will inspire you in your own work. You'll learn different approaches to combining color as well as special techniques that will help you work through challenging color predicaments. And we have special surprise for you this time... a color-centric interview with colorist extraordinaire, Jamie Cloud Eakin. 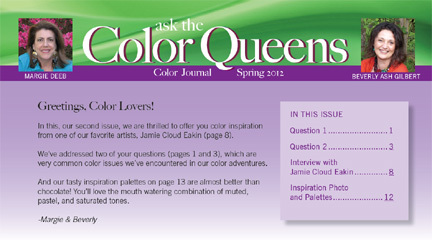 Read how Jamie approaches harmonizing hues with gemstones to create her stunning palettes.